We use our visual information processing skills to interpret what we see. According to psychologist Richard Gregory, people presume to understand what they see based on past experiences, beliefs, and expectations. The brain guesses what a person sees by relying on prior knowledge to then construct reality in real time. Therefore, when a motorist approaches a work zone, their brain is conditioned to expect to see the objects and materials commonly found at construction or maintenance sites. However, darkness introduces another level of complexity to projects. It’s well known that the absence of light makes it more difficult to see not only objects, but other people in work zones. The fact that we’re instinctively geared to notice and to react to the human form aids in being visible in low-light situations. Outfitting work crews with personal protective equipment (PPE) that is retroreflective is a primary step toward improving nighttime work safety. Retroreflective material reflects light back to its source. This reflectivity helps the public navigate work sites and proactively decreases hazardous risks, both at night and during the daytime hours. The advantages of wearing full-body PPE are clearly displayed in the images below. 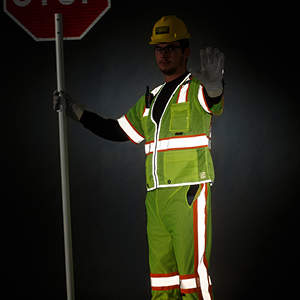 You can see for yourself how wearing no or minimal high-visibility safety apparel compares to the full-body glow. The subject shown not only meets the requirement for 360-degree visibility, but draws your eye with his human figure illuminated in the last image on the right. The American National Standards Institute and International Safety Equipment Association indicate that using highly visible, retroreflective equipment is a key way to reduce accidents. This includes pants, vests, shirts, headgear, and outerwear, as well as using large, reflective signs, cones, and other apparatuses. According to A Guidebook for Nighttime Construction: Impacts on Safety, Quality, and Productivity, “proper clothing is considered the most important element to ensure worker safety” at construction sites. Another benefit of using retroreflective PPE is how it differentiates workers from the working environment and enhances “scene gist.” Scene gist is a psychology theory that says people recognize a real-world scene in a single glance. 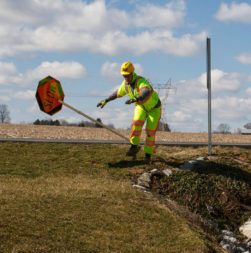 This implies that when workers are dressed in full-body retroreflective PPE, it will provide more visual information to notify motorists to use caution as they are approaching a work zone. Nighttime work zones are inherent with risk. While the human perceptive ability to understand and navigate job sites is impressive, it is critical to supply field crews with PPE that meets the latest ANSI II-III standards to protect everyone. At Flagger Force, we require our field crews to wear a Class 3 vest with Class E pants. Protecting those working on or near our roadways, as well as the traveling public navigating those roadways, is a main priority. Though you won’t be the most fashionable, wearing the proper PPE is the first step toward keeping our communities safe. We use our visual information processing skills to interpret what we see. According to psychologist Richard Gregory, people presume to understand what they see based on past experiences, beliefs, and expectations. Read on to learn more about why full-body retroreflective gear is best to wear when working at night.